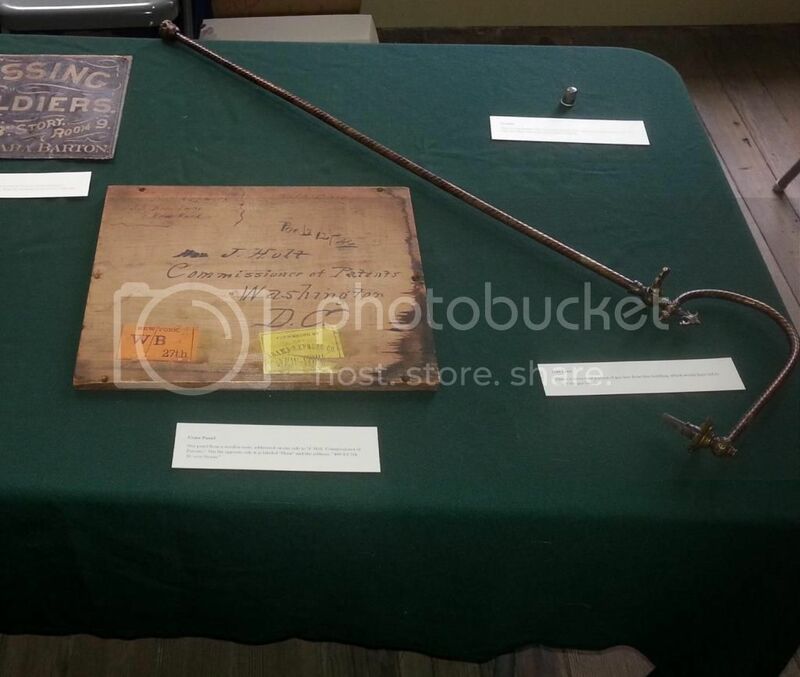 This weekend I took some artifacts out to the Clara Barton Missing Soldiers Office in Washington DC. While we do have the space open to the public on weekends, we’re still raising funds for display cases and a security system for the building. Until then, we cannot put any long-term artifact displays there. I was able to take a few artifacts out for a specific tour though. A group of teachers from around the country came to the CBMSO with a tour from Brightspark Travel. On their tour they heard about Clara Barton’s life in Washington DC, and her work in forming the Missing Soldiers Office. 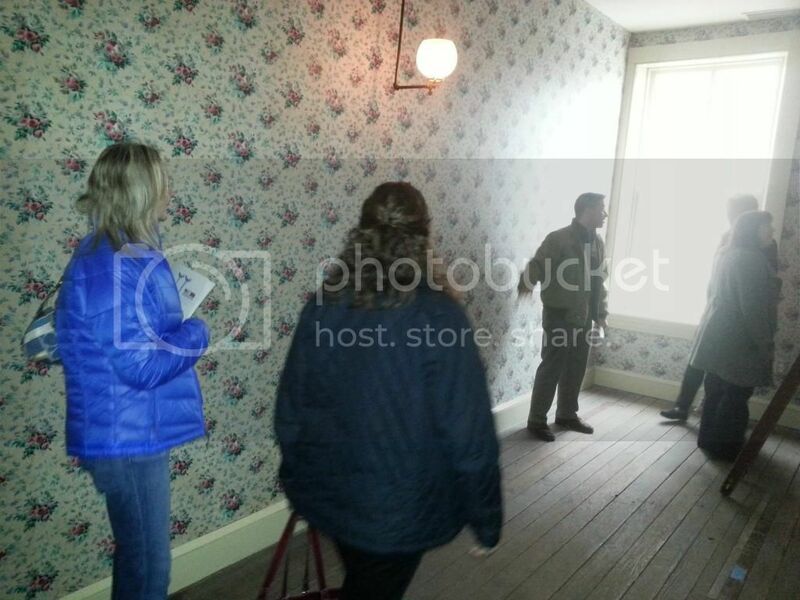 Here, Tom tells some of our visitors about Clara Barton’s private room. 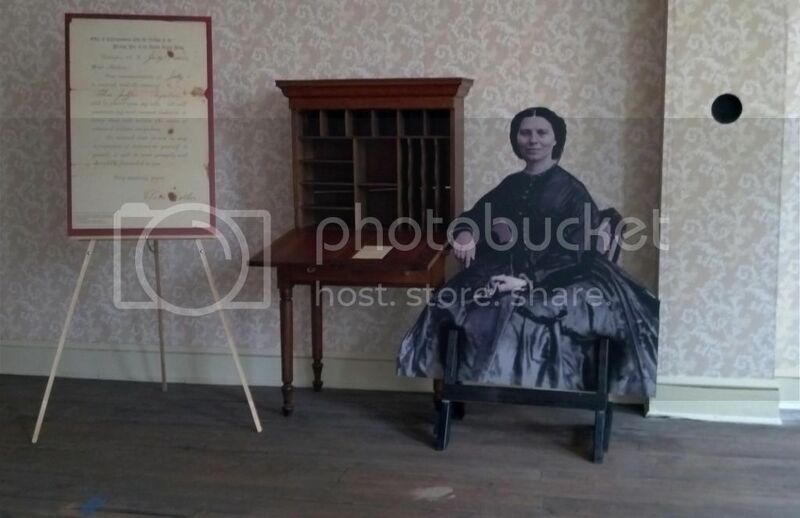 We also now have an area for our visitors to take selfies – complete with a writing desk similar to the type Clara Barton would have used, reproductions of the Missing Soldiers Office forms she sent out to families, and a life-sized cut-out of Clara! 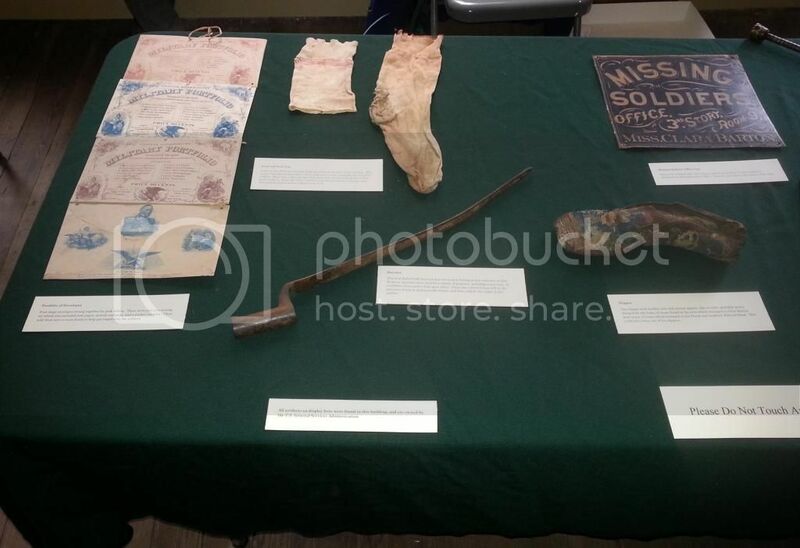 The members of the tour were also able to view a few of the artifacts which were found in the building. The teachers on the tour seemed very interested in them, and I enjoyed being able to tell them a little more about the artifacts. All the items I took to display were found in the building – most of them packed in boxes in the attic. Some of the boxes contained items which belonged to Clara Barton, while other boxes belonged to her friend and landlord, Edward Shaw. On display were a portfolio of envelopes from a writing set, a man’s slipper; the original tin sign Clara Barton posted on the front of this building to advertise her Missing Soldiers Office; a bent Enfield rifle bayonet which could have been used as a pry bar or could have been part of her relic collection from Andersonville Prison; and two socks which she was probably having mended to send back out to the soldiers. Here you can also see a small steel sewing thimble and a portion of conserved gas line from the building. Also on display was a panel from a wooden crate, addressed to the Commissioner of Patents. On the opposite side it is labeled “Shaw”, with the address, “488 1/2 7th St. over Steens.” It is likely that Clara reused such crates to send supplies to the soldiers on the battlefields. The artifact display was quite popular! I’m looking forward to the time when we can have artifacts on display out there more permanently! In the meantime, the CBMSO will be closed starting November 24, 2014 through January 15, 2015 and will reopen on January 16th. We’re also planning a re-dedication of the Clara Barton Missing Soldiers Office in the spring of 2015. I hope you can come out for a visit! Photos courtesy of the National Museum of Civil War Medicine. "Rich Man's War, Poor Man's Fight"
No Mules Allowed in the Galleries! Some Museum History and Ghost Stories!